The chapter looks at the triangular relationship among the Philippines, the United States (US), and China, against the backdrop of the South China Sea disputes. More specifically, it examines how the Philippine foreign policy toward the two great powers, China and the US, has evolved in recent decades. First, it briefly looks at how the Arroyo administration (2001–2010), intent on diversifying the Philippines’ foreign relations in the post-Cold War period, tried to reduce the Southeast Asian state’s dependency on the U.S. by reaching out (2004–2008) to Beijing, giving birth to what many saw as a “golden age” of Philippine-China relations. Second, it looks at how the succeeding Filipino administration, under President Benigno Aquino, abandoned equi-balancing in favor of aligning with the US against an increasingly assertive China, which stepped up its maritime jostling in the South China Sea from 2009 onwards. The shift in the Philippines’ posturing coincided with the introduction of the US Pivot to Asia (P2A) policy in 2011, marking a qualitative shift in the strategic complexion of the triangular relationship, with Manila and Washington ramping up their military alliance—culminating in the 2014 Enhanced Defense Cooperation Agreement (EDCA)—to check China’s territorial designs in the South China Sea. 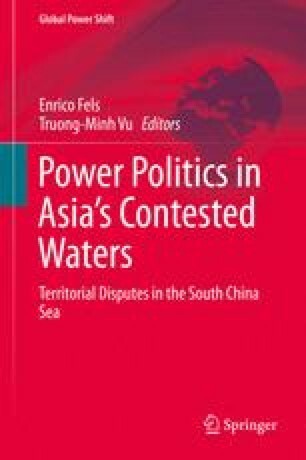 The chapter examines the nexus between domestic political shifts, especially within the Philippines, and regional geopolitical developments, especially in the South China Sea, to trace the dialectics of the triangular relationship. ASEAN Affairs. (2010). China-Philippines trade declines 30 % in 2009. Retrieved December 1, 2010, from http://www.aseanaffairs.com/philippines_news/trade/china_philippines_trade_declines_30_in_2009. International Crisis Group. (2012). Stirring up the South China Sea (II): Regional responses. Retrieved January 1, 2014, from http://www.crisisgroup.org/~/media/files/asia/north-east-asia/229-stirring-up-the-south-china-sea-ii-regional-responses.pdf.